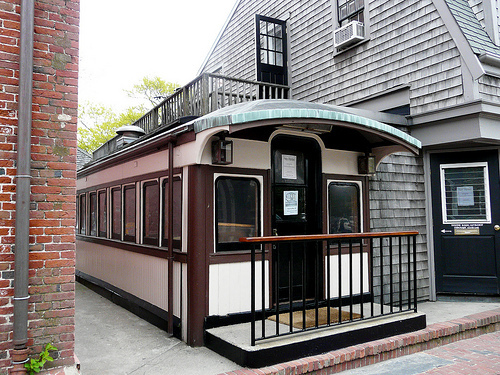 Did you know that Nantucket once had its own narrow-gauge railroad? The Nantucket Railroad began in 1881 and operated for thirty-six years. It transported visitors from the steamboat wharf ,through the Creeks and moors to summer resort hotels and cottages at Surfside and ‘Sconset. Unfortunately service was rarely reliable or profitable and storms caused frequent damage along the south shore line. The railroad finally succumbed to the automobile and in 1918 the rails, two cars, and engine No. 2 were sent to France, for use during World War I. Today one of the passenger cars can be seen on Main Street ,now part of the Club Car restaurant.